Hello there, are you having a lovely weekend? I think for us today is meant to be the last nice day, the weather is changing but hopefully not for long, I am enjoying the bright and sunny days, I really am. Today is Jules birthday !!! YAY!! She is 21 again yeah right !! Now she loves cupcakes like you wouldn't believe so it was natural I made a card that had a cupcake on. I have saw a brilliant card in a Stampin'Up! 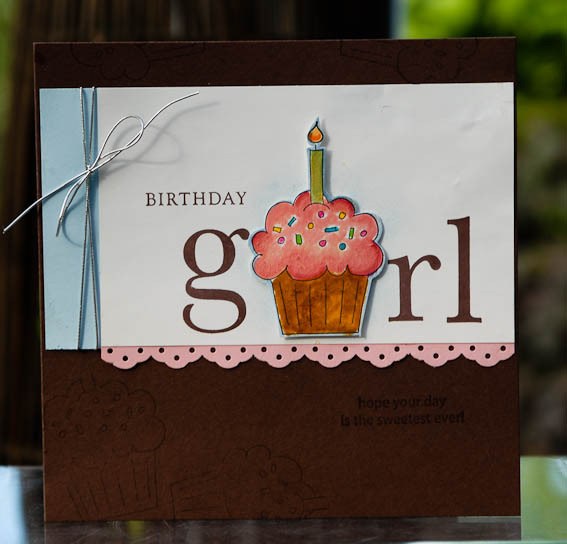 publication on the 1st of July and as soon as I saw this card I knew I would have to make it for her birthday. Jules likes brown as well so I chose a Choc Chip base and I used the big cupcake from Crazy for Cupcakes set, I have coloured the image using markers (I love those for quick intense colouring). Jules also likes her alpha sets for adding personal messages or names to her cards one of another reason why this was so perfect for her. The girl word was stamped with the aid of the Stamp a ma Jig using the Just Schoolbook Seriff alphabet. A touch of pink and bashful blue and a bit of silver cord completes this sweet card. I really like how it turned out I just hope she does too. Jules I hope you had the most wonderful day ever HAPPY BIRTHDAY sweetie. In the last week I got some not so nice news, a few close friends are going through some hard times at the minute so I had to make a few cards just to say **I am thinking of you**. Again I chose a SU publication for inspiration and this time the idea was provided by our last Mini catalogue. I changed the colours and layout just like with Julie's card but the main idea was from there. Choc Chip base again, and the strips are Certainly Celery, Old Olive and Rose Red card stock. 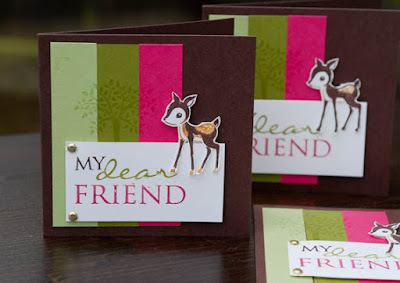 The dear from the Forest friends stamp set was inked with markers to get the two tone effect, and the lovely sentiment stamp is from Occasional Greetings. I used Choc Chip, Old Olive and Rose Red markers to ink the sentiment stamp. How sweet is this sentiment used in conjunction with this stamp? My hope is that this card brought a smile to those lovely girls. Ok I am off now as I just had tea (chinese takeaway) and have 50 thnak you cards to go thorugh. I have to say that your blog is the most colorful, very professional and so friendly... The Best as I've seen so far. I just regret that I haven't seen your blog earlier, definitely I would sign in under your down line as a demonstrator.